"The Fantastic Four Meet the Moleman"
This issue is significant for several reasons. 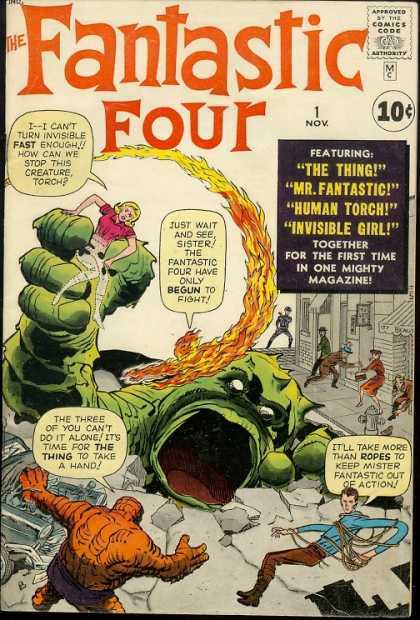 Obviously, this shows the first appearance of Marvel's first supergroup, the Fantastic Four, and the origins of the four original members. It also shows the Mole Man and his Moloid subjects for the first time. 1. The Fantastic Four are not in costume in this first story. 2. The Mole Man's code name is misspelled "Moleman" in this issue. 3. Johnny Storm is the second "Human Torch", the first one appearing in the 1940s as an ally of Captain America and the Invaders. 4. The Invisible Girl is later known as the Invisible Woman, and her alter ego's last name changes to "Richards" after her marriage to Reed Richards.